As you age, muscle, bone strength and flexibility decrease. Muscle mass decreases as a normal part of getting older. Bone density also decreases with age, especially for women after reaching menopause. You can also lose flexibility and mobility. Due to these bodily changes, Senior Citizens are more susceptible to injury. Older Adults have increased hospital visits and medical care. 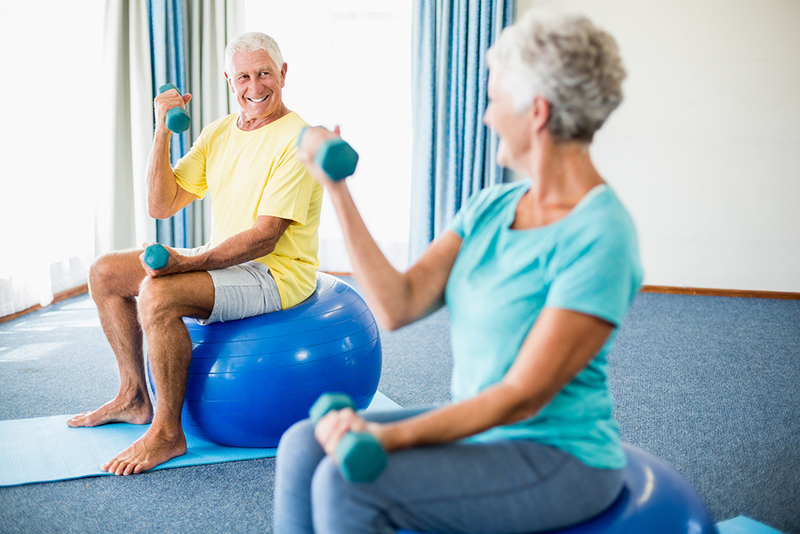 Proper exercise can help you stay strong and flexible in your senior years. Muscle mass loss known as sarcopenia can start early. People who lead sedentary lifestyles can lose up to 5% muscle mass each decade after age 30. Even active individuals will experience some decrease with age. Sarcopenia increases the risk of frailty, falls, and fractures. The best way to combat muscle mass loss is through resistance training. Aqua exercise offers added water resistance with low impact on aging joints. Resistance bands and weights are good strength training options. When starting out, you can also try bodyweight exercises such as pushups and squats. These activities help you stay strong and flexible by building muscle strength and endurance. As we age, bones lose calcium and other minerals. People over 60 are at an increased risk of bone-related injury. Weak and brittle bones (osteoporosis) contribute to a chronic condition that can result in years of discomfort. By improving bone strength with proper meal planning and physical activity, this dilemma can be minimized. Eat a balanced diet rich in calcium and Vitamin D. Calcium builds strong bones and Vitamin D aids in calcium absorption. It’s also important to maintain a healthy body weight. Being underweight increases the risk of bone density loss. Moreover, weight-bearing exercise helps maintain bone strength. When starting out, try a 10-minute work out twice a day. The ultimate goal is at least 30 minutes of strengthening activities each day. Going outside to exercise is also a great way to get Vitamin D from the sunshine. Decrease flexibility associated with aging can impact your everyday life. Limited mobility leads to slower walking speed, shorter gait, back pain, and increased risk of falls. Regular stretching and exercise help maintain flexibility as you age. Engage in activities that use your body’s full range of motion such as stationary stretches or yoga. Looking for a simple exercise routine to maintain flexibility and strength? Gentle activities such as Yoga and Qigong (a Chinese system of physical exercises and breathing control related to Tai chi) improve your balance and circulation. Hunterdon County offers a wide range of fitness classes for Older Adults. At Anita’s Angels Inc, our caregivers can assist you in staying strong and flexible in your senior years. Schedule a time to see how we can help. Call 908-788-9390.